Difficulty Notes: No difficulties if taking the hiking trail / easiest route. 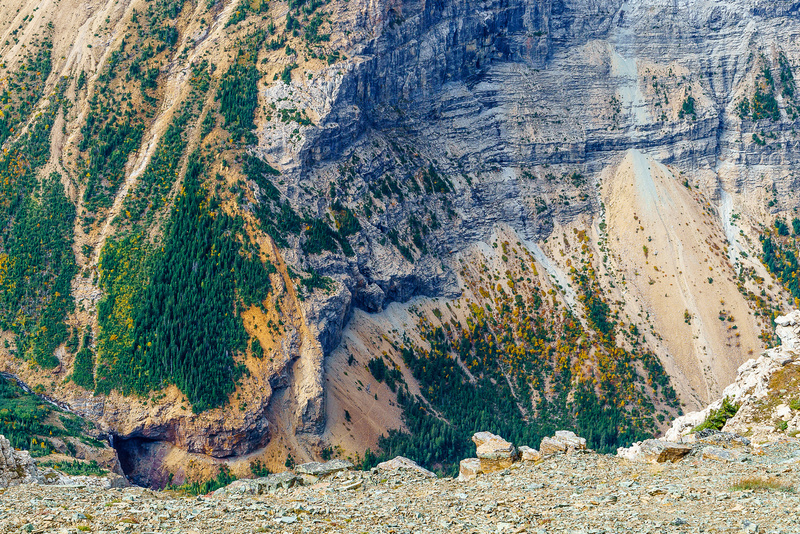 Nugara has some scramble routes if you’re looking for something a bit spicier up Vimy Peak. 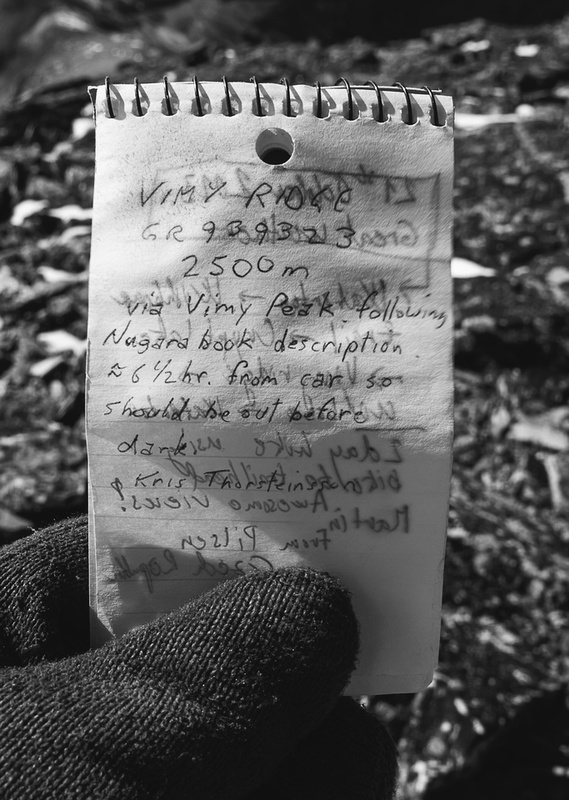 Some of the route between Arras and Vimy might be a bit much for the average hiker and obviously this is a big day if doing the whole traverse. Ah yes. I was due for one of these extremely rare days in Waterton Lakes National Park! What days, you ask? Those rare gems where the wind is manageable and “sunny” actually means you see blue sky and the ball of fire sustaining life on our fragile planet! 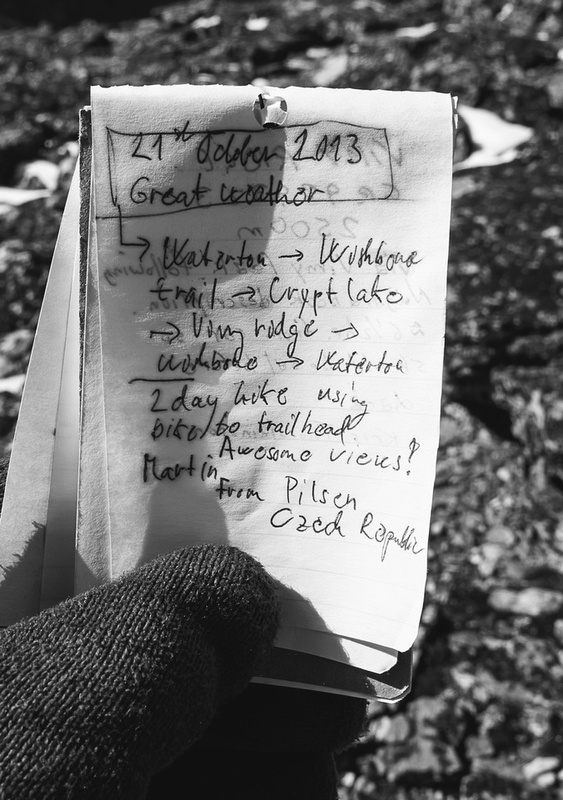 Oh – and of course those days when you have a route planned out that will take 100% advantage of these conditions. 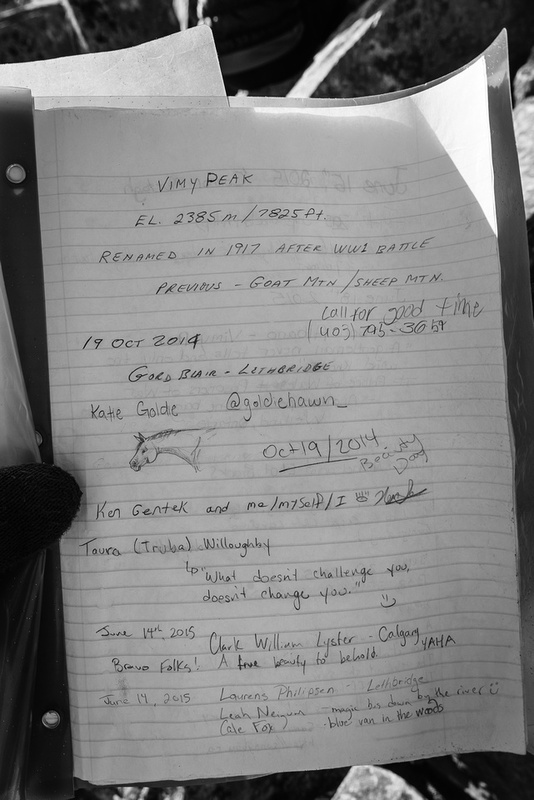 In our case Phil Richards and I were planning a grand traverse from Vimy Peak to Arras Peak (Vimy Ridge) to the highest point of Vimy Ridge (GR939323) and back again. Vimy Ridge Google Earth Route View. The sun was coming up as we experienced something very unique and special while biking near the river crossing on the flats. At first we heard what sounded like people being tortured – the screaming was pretty intense! After few minutes we realized we were in the middle of a huge Elk rut! Wow. We saw at least 30 elk, including 5-8 LARGE bulls with massive racks. The bulls were calling out loudly, circling each other and generally getting their rut on. I thought we’d have to turn back more than once, but amazingly the huge animals let us through unscathed. We didn’t get stupidly close of course, but we had to wait for the animals to move out of our way several times. I’d have been really nervous on foot – I felt that we looked bigger on bikes. The two images that really stand out for me are two huge bulls ready to engage. They stood there, heads lowered, for about 5 seconds before deciding they’d save the fight for later. The other image is a lone bull, the largest we saw, standing in the morning light with the mountains behind him lighting up and his breath clearly visible streaming from his mouth as he called loudly for a mate. Pretty cool stuff. 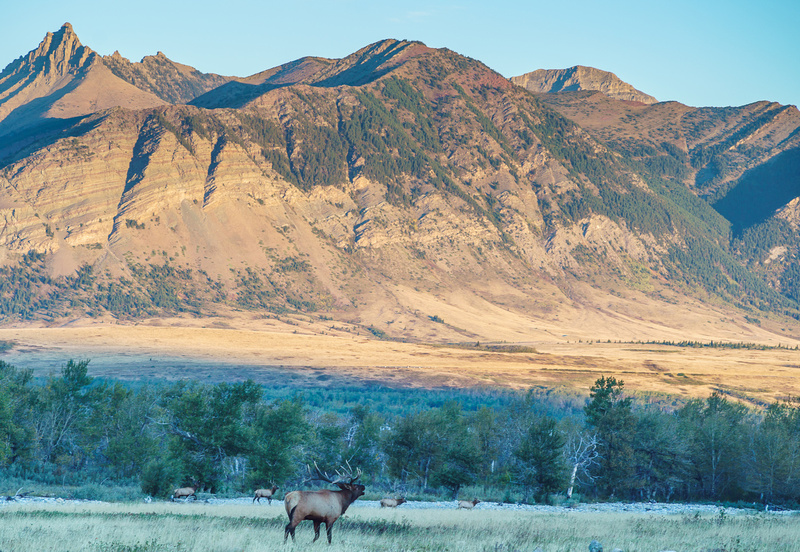 A beautiful scene with bull Elk calling for their mates in the early morning light. Since our day was pretty much made at this point everything else would be a bonus. And what a bonus it was! We biked a bit further than the river before coming to the split in the trail. We took the left fork up to Vimy Peak. Maybe I was just in a good mood but the trail up Vimy is fantastic. It’s very well designed in that it doesn’t lose or gain unnecessary height. I admire trails that manage to take the best possible line to their destination and this is one of those rarities. Phil set a furious pace (probably slow for him…) and I must have been feeling good because we still managed to chat about just about everything on the way up. The pace and chatting made the approach fly by and before 3 hours were even up; we were standing on our first summit of the day. This was my favorite section of the approach – up a draw that used to hold a stream that’s now dried up on top. 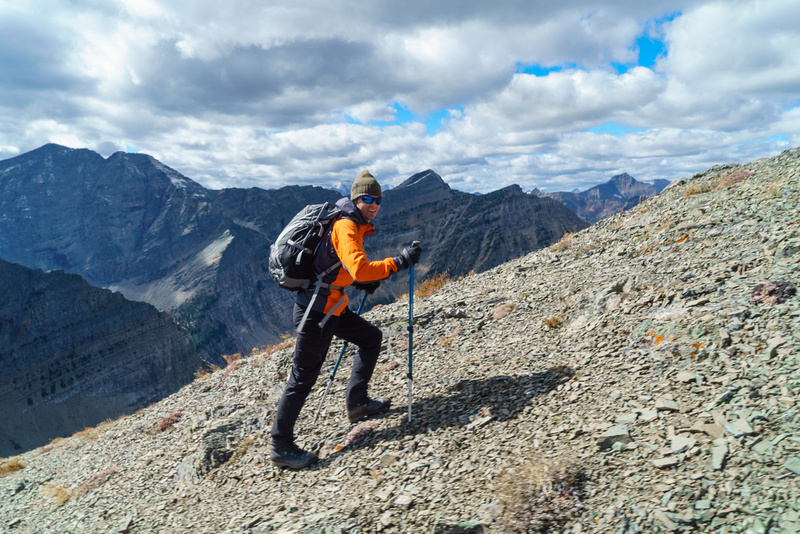 Phil on some steeper terrain near the summit of Vimy Peak with Middle and Lower Waterton Lakes below. 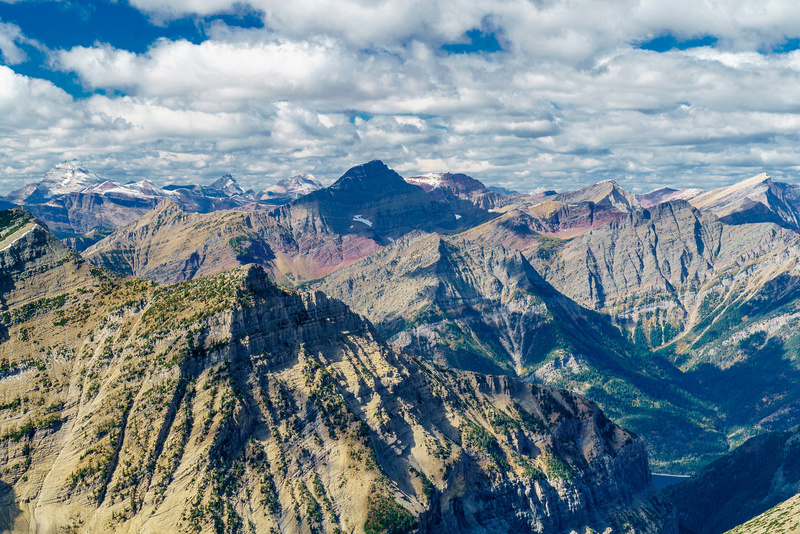 A panorama from just under the summit where the view of the Middle Waterton Lake is best. Tele panorama of some distant giants including Custer at center and Richards in the foreground. 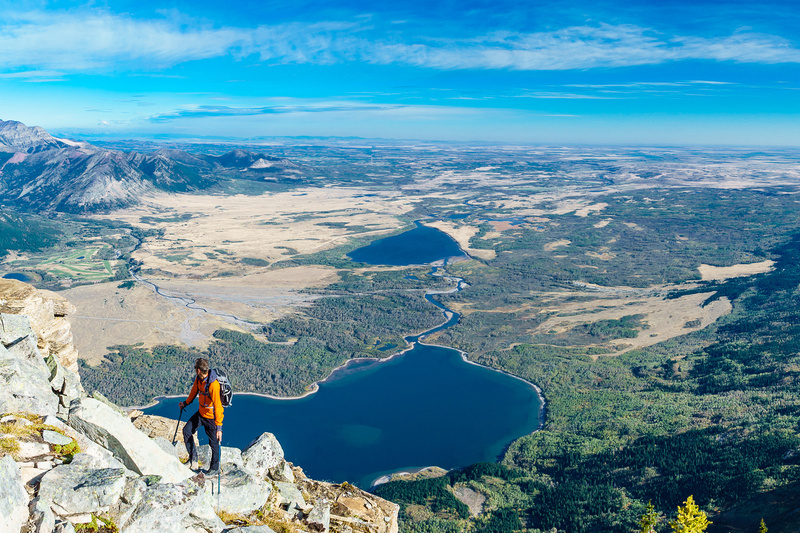 Vimy Peak is an easy scramble but it has amazing views of the Waterton Lakes and the small Waterton town site far below. I scrambled off the summit in order to get the best views of the lakes. The most amazing part of the summit was that we could sit there and enjoy our views with very little wind and warm sunshine. This is NOT normal for Waterton. We were thinking that our day was just getting better and better. After signing a very full register (at least 30-40 entries per year) we continued on towards Vimy Ridge, or Arras Peak as it’s also called. The largest elk bull we saw - there were at least 8 of them. Our first glimpse of Vimy Peak from the approach trail. The only water source after the biking section, for the rest of the day is this small stream. Use wisely. Phil set a furious pace up the steep approach trail. There are few breaks from the climb. This was my favorite section of the approach - up a draw that used to hold a stream that's now dried up on top. I love fall in the Rockies. Another shot of Phil on the exposed top part of Vimy Peak. The small, quaint town of Waterton nestled by the Upper Waterton Lake. The bay near the town is known as "Emerald Bay". Upper Waterton Lake towards mountains in both Waterton and Glacier National Park, including Richards (R), Campbell (L) and the snow covered peaks, Custer, Chapman and Olsen. Mount Cleveland. I was first introduced to this mountain by the climbing tragedy that occurred here in the winter of 1969. Lakeview Ridge isn't very big from this angle! 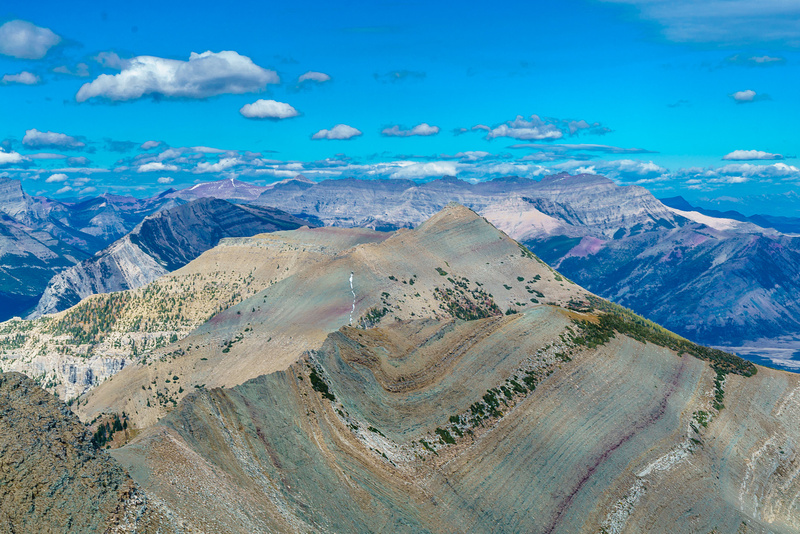 Wonderful Waterton colors on Ruby Ridge, looking over Crandell with Blakiston, Anderson, in the bg. More gorgeous color looking across at Bertha, Alderson, Carthew and Buchanan. 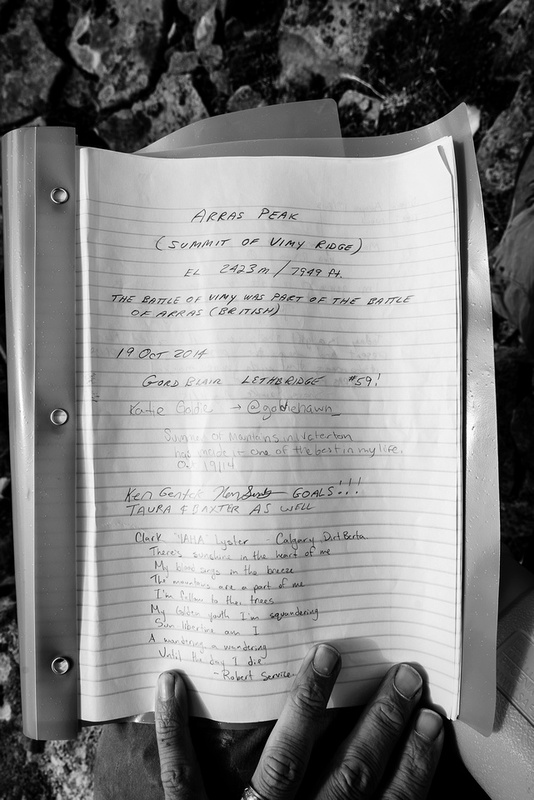 A full - but interesting - summit register. 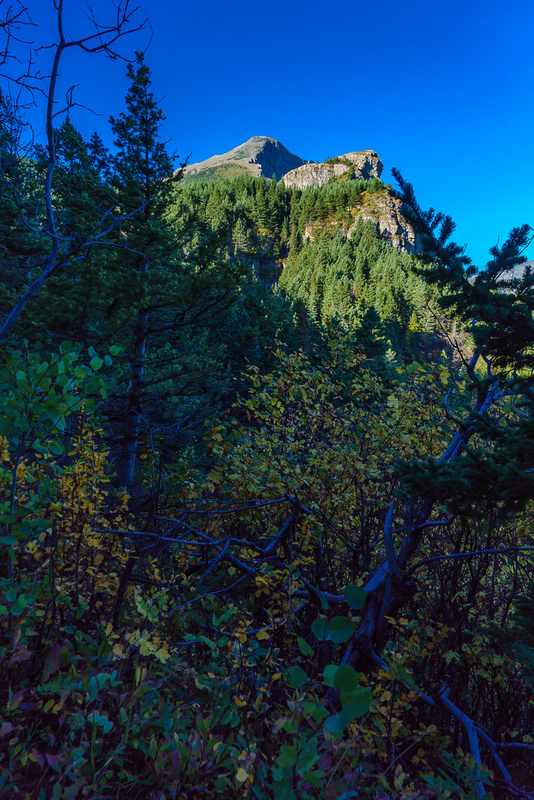 This peak is extremely popular as it rises over the town site of Waterton and has an easy trail up. There isn’t much I enjoy in life more than a high line traverse in the mountains. I love them because I feel like I’m flying above the landscape. This only works, of course, if you can actually see the landscape (unlike on Rowe / Festubert the week before) and such was the case on our traverse from Vimy Peak to Arras to GR939323. Not only were the views completely sublime, but also the wind was extremely light for the area, allowing us to converse while we walked. This is not normal. The first thing you should note is that just as with all traverses, the destination isn’t quite as close as it appears. It isn’t “Festubert far” but it’s going to add hours to your day even if you’re fast – which Phil definitely is. The ridge traverse from Vimy Peak starts off very easy with great views across the Crypt Creek to Mount Boswell and Cleveland in the far distance. The first part of the traverse from Vimy Peak was very easy. We even bypassed the first small bump on climbers right before encountering slightly more challenging terrain. I think Nugara calls this “easy” but if you’re more of a hiker than a scrambler you will find it “moderate”. You can stick right to the ridge crest but travel is slow there. We found traversing on climbers left of the ridge a wee bit quicker (not much) and eventually we crossed over to climbers right to finish that part of the traverse. Lovely color on Sofa Mountain. The expansive views towards Crypt Lake on one side and Sofa Mountain on the other, with Mount Cleveland looming over everything kept us entertained while we travelled. Phil’s favourite lines are “but why is it like that?” and “what made it do that?” and he applies this liberally to the micro terrain as well as the macro (he has two master’s degrees and a doctorate). 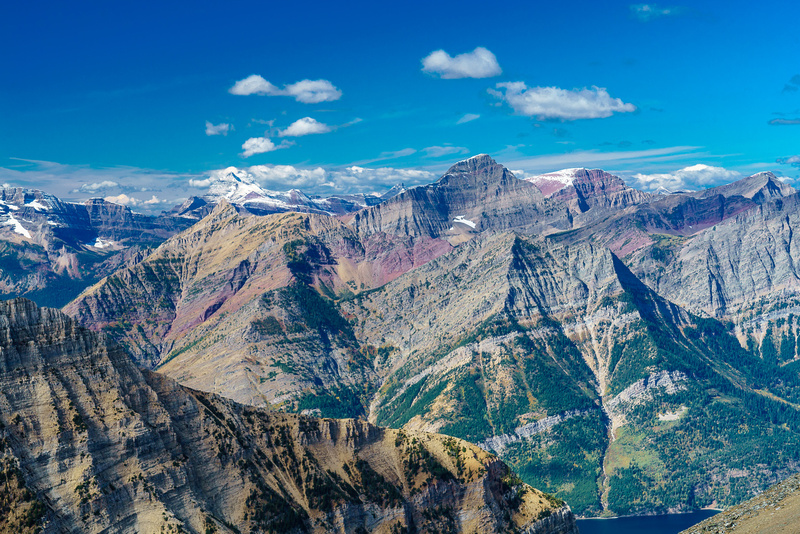 Waterton, with its fantastic smorgasbord of rock and vegetation, provided Dr. Phil with many such opportunities of scientific inquiry. There were rocks and crystals of many shapes, colors and arrangements along the entire ridge. Some sections looked like patio bricks, complete with perfectly straight lines and interlocking pieces. Other sections had small erratic lumps of rock that didn’t seem to belong. In yet other sections there were old, gnarled trees that had to be hundreds of years old with their offspring nestled in their arms, protected from the wind even as the ancient ones finally gave up their lives in this harshest of environments. Phil and I both decided that he needed to get another masters or doctorate degree in geology sometime soon in order to start answering some of his own damn questions! The view of the entire Crypt Lake valley, stream waterfalls and lakes is incredible from up here! Looking back at the traverse – it’s already quite a long ways back to Vimy Peak. An interesting waterfall along the Crypt Stream / Lake approach hike. The views to the east are nice too! Arras is visible along the snaking ridge in the far distance. Great views to Mount Boswell and up towards Crypt Lake. Upper and Lower Crypt Lakes. A look across Crypt Creek back to Vimy Peak on the right. Views over Waterton Lake to Mount Custer. Lovely colors on Sofa Mountain. Looking back at a high point with Vimy Peak on the far left and Sofa Mountain on the right. The terrain gets slightly more complicated between Vimy Peak and Arras. Phil traverses back onto the ridge proper after we did a slight detour on climber's left. Facinating micro terrain all along the ridge. Looking back at the traverse - it's already quite a long ways back to Vimy Peak. Phil climbs up towards Arras Peak. More amazing colors from Richards to Alderson to Carthew and Bertha peaks. Looking across Ruby Ridge to Buchanan, Galwey, Carthew and Dungarvon. Looking all the way back to Vimy Peak with Bellevue Hill and Galwey beyond. I think Phil would almost fit in the summit register! A 30 or 40x decrease in the number of register entries compared to Vimy Peak! That's it. Only 1.5 pages, compared to 30 in the last register. I guess the moderate scrambling and distance really turns most folks off. The view of GR939323 from the summit of Arras Peak (Vimy Ridge). As I already indicated in my Arras Peak report, I don’t understand the naming of peaks along Vimy Ridge. 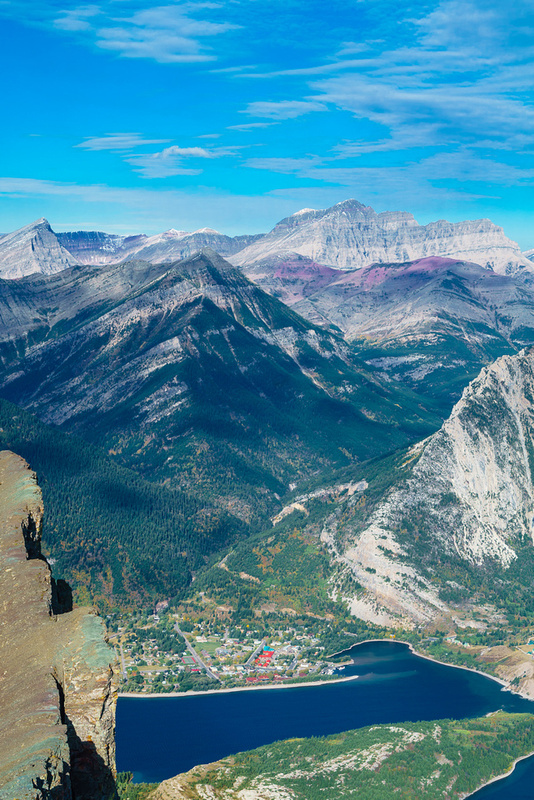 Vimy Peak makes sense, as it’s the peak looming over the Waterton town site and named for a famous WWI Canadian battle. Arras Peak makes sense, as it’s a distinctive peak along Vimy Ridge and is the name of the overall WW I objective that Vimy was the opening act for. What doesn’t make sense (to me) is that GR939323 should be named Vimy Ridge as it’s the terminal apex of the long ridge running from Vimy Peak! Oh well. Lowly “grid reference” it remains I guess… Who cares in the end? The low cliff bands are clearly visible as we get down to the col between Arras and GR939323. GR939323 looks pretty easy from the summit of Arras, but it’s the best scrambling we got all day. There are a couple of low cliff bands running across the ridge and we chose to scramble right up some of them, just for fun. Good thing we left the brain buckets at the parking lot… After scrambling through the cliff bands we labored up final rubbly scree slopes to another wonderful summit panorama in windless, sunny conditions. Another view of the nice valley between Arras, GR939323 and Sofa Mountain. The views into the North Fork Belly River valley and towards Chief Mountain and the Blood Indian Reserve were special. Upon closer inspection, and with the assistance of my telephoto lens, we even managed to spot a large herd of Mountain Goats far beneath us at the headwaters of the North Fork Belly River. We spent some time on another windless summit, enjoying our day and the fact that we were now half way done our trip. Looking down the international border from the summit of GR939323 with Chief Mountain on the right. Looking across Upper Waterton Lake at Richards, Bertha Alderson, Buchanan and Carthew. 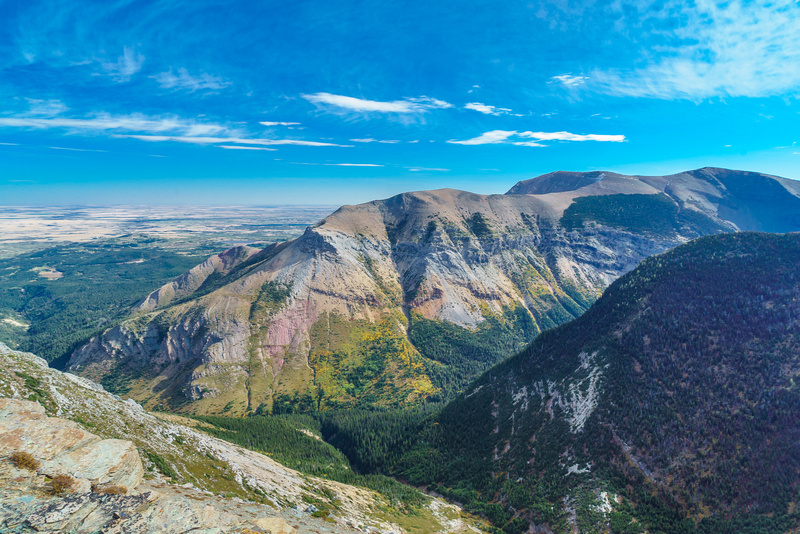 Tele pano of Lower Waterton Lake with part of Bellevue Hill and Lakeview Ridge on the left. We descended GR939323 fairly quickly, finding easier lines through the cliff bands than on ascent by going slightly further skier’s left. As we made our way slowly back up and along Vimy Ridge towards Vimy Peak the sky began to cloud up a bit and the wind picked up – but nothing too extreme. When we got back to the high point before Vimy Peak we took a shortcut route into the upper bowl on Vimy’s east flank which saved us having to re-ascend Vimy Peak. There was an obvious trail on this slope with huge switchbacks. We lost the trail for a bit, but after traversing straight left we found the trail and followed it back to the bikes. A great shot of Phil with Crypt Lake beneath him and Cleveland in the background. The bike ride out was surprisingly quick. We expected to be doing a lot of uphill pedaling as the morning bike seemed mostly downhill. We must have had a lot of caffeine that morning, because it wasn’t bad at all! There was no sign of the rutting elk on our exit and we only ran into one couple just before the parking lot. 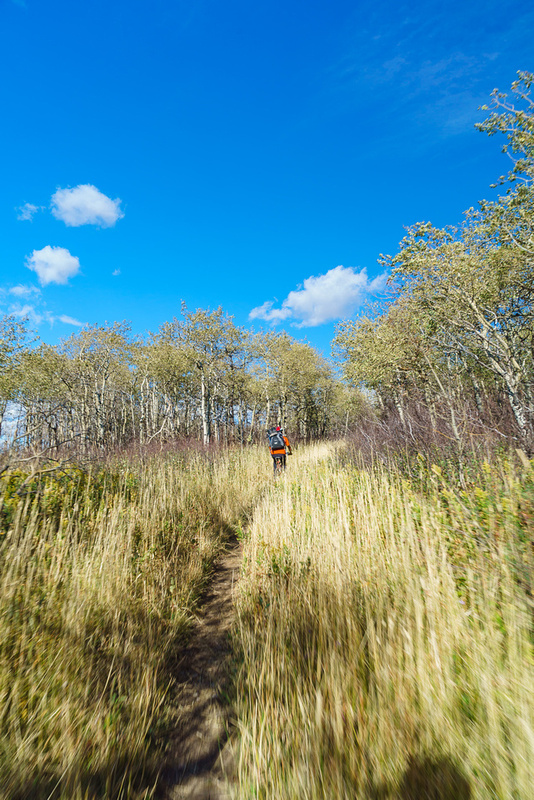 Biking back in the Waterton grass flat lands. I couldn’t believe that we did the whole traverse in just under 10 hours! I think this is a pretty fast pace – thanks to Phil the long distance runner. I think on my own this would have been a lot closer to 12 hours and for a larger group, 14 hours or more would not be unexpected. This was one of those very rare days in Waterton that gifted us with light winds and mostly sunny skies. I really enjoyed this trip. The micro terrain is fascinating on the entire traverse. The south face of GR939323 is pretty impressive. Looking back at Arras as Phil descends to the Arras / GR939323 col. Looking back at Arras from part way up. I couldn't find a name for the impressive peak on the left. Crypt Peak? Nice colors - I bet this valley doesn't see many humans. Looking back along the traverse at Vimy Peak. It doesn't look far, but it's a ways off! 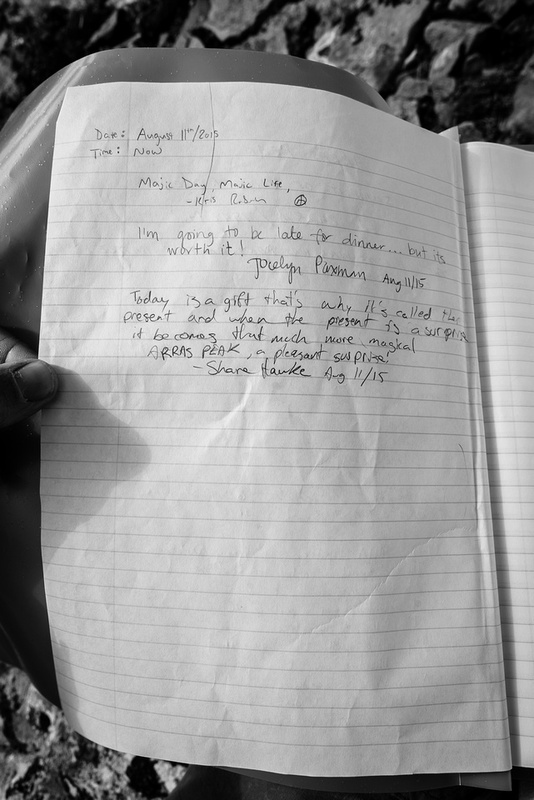 Another Kris Thorsteinsson register - he knows how to bring a register that can be used to do arm curls at the summit! A Czech guy did this peak as part of a two day traverse from Crypt Lake. The last entry was a traverse all the way from Sofa Mountain! That's a nice outing! 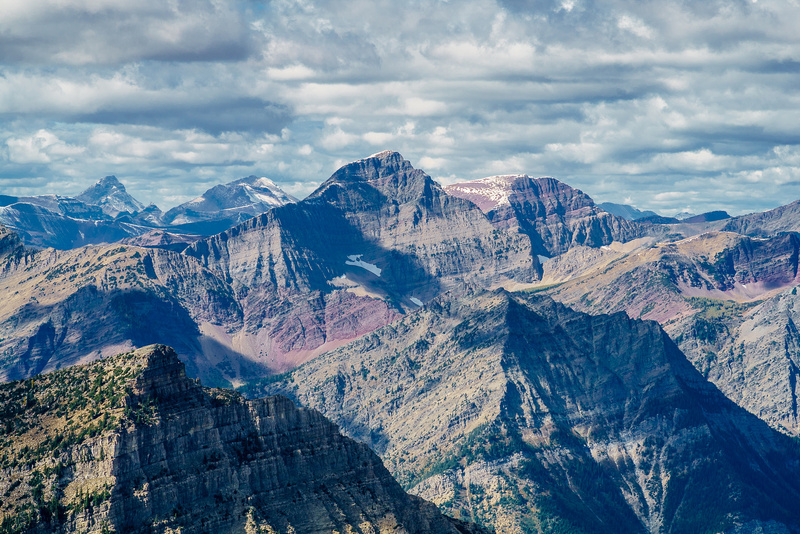 I'm not 100% sure but I think this is Campbell Mountain in Glacier National Park. Ruby Ridge with the giant (for the region) Blakiston looming 400m highter than our peak behind it. Bertha in front of Alderson and Carthew. Three distinctive peaks beyond Richards. Goat paradise in the headwaters of North Fork Belly River. Descending shale cliffs on the return to the Arras col. This sort of stuff puts Phil in a strange trance where he mutters to himself things like - "But WHY is it LIKE that?!" Interesting slab on the ridge. A great shot of Phil with Crypt Lake beneath him and Cleveland in the bg. Back on the hardest part of the traverse, just before the high point before Vimy Peak, which is on the left. Descending to the east of Vimy Peak - shortcutting our way back to the ascent trail which is somewhere in the trees below. The trail runs out soon, but we simply traversed left to find it back. Vimy on upper left. What a glorious day to NOT be at work! Looking back at Vimy Peak. These cairns mark the exit from the Sofa Creek crossing. Biking back through tall grass.